Main purpose of this report is to observe and analysis Poultry Industry of Bangladesh, it is a Strategic Analysis of Poultry Product Marketing of C.P. Bangladesh Company Limited. Other objectives are provide the current market situation and develop a better marketing strategy for the companies. Also discuss on product marketing Strategies of C.P Bangladesh Co. Ltd. Finally find out some some problems related Poultry Industry and suggest recommendation to overcome the subsequent business obstacles. In the report “Poultry Industry of Bangladesh– A Strategic Analysis of Poultry Product Marketing of C.P. Bangladesh Co. Ltd.”, it has tried to find out the prospects and the problems of the poultry industry. This report will help the new entrepreneurs and small scale poultry producers. Here the production procedure and marketing system are being highlighted through the marketing process of C P Bangladesh. The grass-root level farmers of poultry are suffering from high risk and insufficient profits. Also the distributors are not enjoying a risk less profit. There is a insecurity and instability found in the market right now. Most of the companies including CP are suffering losses. Due to the deadly threat from bird-flu all the stake holders fear to invest farther. Despite the fear of bird flu C P is investing more and more in the industry to take the advantage of the opportunity of less competition. The raw material price was unstable too due to high demand in the international market. This high price creates a problem for both the company and the farmer. The farmers are getting expert day by day with help of Private companies and government raining facilities. Because of the nature of the product (Live and perishable), the marketing process has faced many difficulties. The companies and the farmers have to sale their product as soon as it ready. Bangladesh poultry industry is ready to fulfill the demand of this country and in the near future this industry could be exporting poultry product. Product marketing Strategies of C.P Bangladesh Co. Ltd.
To provide information about research & development. Poultry is one of the important sectors of agriculture in Bangladesh for maintaining the need of protein and nutrition. This industry is growing largely as a profitable business. This paper will try to come across the insides of the total industry (For chickens and eggs) form production to final consumption. From the 1980s the commercial poultry production are starting in Bangladesh. Now it is seen that small scale poultry production contributes a lot in the total industry. We have to protect it and make bigger to catch the overseas market. The research is an exploratory research. Both the primary and secondary data of C.P were collected for the research. C.P. : The sources of primary data are the interviews of the managers and other employees of different departments of C.P. Observation and working with the clients’ database were other sources of collecting the primary data. C.P. : The secondary data were collected from the annual financial reports of the company. Also from the brochures, and Internet web site of C.P. Poultry is considered as an important source of animal protein all over the world. In Bangladesh, poultry contributes a major share of animal protein simply because of the limitations and religious taboos in case of pork and beef. Bangladesh is a country the people of which consume the lowest percentage of protein than the minimum requirements because of inadequate supply of protein-generating food products. Poultry meat and egg can effectively fulfill the shortage of protein requirement, since it can be produced at the least cost, lowest time and efforts than the other protein producing animals. Commercial poultry industry is growing rapidly in Bangladesh. Estimate shows that poultry population is increasing at the rate of 6.5% per year in the country. There are over 116.5 million chickens and 13.47 million ducks in Bangladesh. This poultry sector is growing may be because the fish population is declining and people are switching to poultry as a source of animal protein. According to a 2006 census completed by the Department of Livestock Services (DLS) and the Poultry Sector Development Project (PSDP), there are approximately 38000 commercial poultry farms housing 124,10,000 layers and 107,84,5000 broilers in Bangladesh (Jarjour, 2006). These poultry farms are producing approximately 10474 tons (I.e., 1063 million tons year) of excreta every day in the country. Following is a summary of the evolution of the poultry industry in Bangladesh. Poultry plays a vital role in Bangladesh & involves 85% of rural people. Improved variety of birds firstly imported in 1935. Six poultry farms were set up in 1947 at different locations of the country, ‘Eggs and Hens’ in 1964. BRAC developed “Rural Poultry Model” in 1983. In early nineties, private parent stock farm started. Large scale eggs and meat production have increased production from last 15 years in this country. AFBL introduced dressed chicken marketing at first in Bangladesh. P. Bangladesh Co. Ltd. started its operation as a lone foreign company in the Bangladesh poultry industry in 1999. P. Started to Marketing Cooked chicken items in 2008. Poultry industry adds more values than any other industries. In our daily life we need to take meat for getting animal protein. So the poultry producers produce a big quantity of eggs and meat which play a great role to the national economy. Poultry contributes a large part of our GDP. Government declared poultry as a thrust sector & classified as agro based industry. Both eggs and chicken meat have huge domestic demand. And poultry is the sector for obvious profit. Government liberalized its policies by introducing easier loan procedure, lower interest rate, tax holiday etc. Free training with payment is provided to the interested from mass people to encourage the willingness. Some small amount loan is given among the people to grow the poultry production. Egg production has been increased during last 10 years; Poultry meat production has been doubled. It contributes- poverty reduction, new employment generation, and nutritional status. There are many people shifted from serial to non-crop about 5 million people. In the traditional rural backyard scavenging, we see the poultry are not farmed in scientific way. Many people take training but they do not follow the exact way. This category is mainly used for satisfying domestic needs. The second category is semi-scavenging system where combinations of traditional and scientific approach are used. Commercial and domestic perspectives are considered in semi- scavenging approach. In the commercial farming system is only for commercial purpose and the poultry are produced under a control environment. In the integrated farming system the production chain of poultry exist with producers, feed suppliers, marketers and/or farmers. Most of the farmers are technically unsound. And small farmers are not aware about quality of chicks, quality of feed, disease prevention and control techniques, bio-security of farms, etc. Credit facilities are available from bank, some reputed NGOs s well as the feed sellers. Most of the farmer markets their products with their feed sellers and the whole sellers. The distributors play a vital role in the supply of capital to the farmers as credit facilities. Most of the farmers arrange capital to prepare the farm and purchase day old chicks. But they depend on the distributors for feed. The distributors provide credit facilities to purchase feed for the day old chicks. The growth trend of parent stock (both layer & broiler) imported parent stick and local parent stock ratio is negatively correlated. We see the imported parent stock of chicken was 2,300,000 kgs and local parent stock was only 300,000 kgs. And in 2004 it was 1,900,000kgs and 500,000kgs respectively. In the year 2005 we see the local and imported parent stock became closer in approximate 1,500,000kgs. Finally, in 2006 the local parent stocks exceed imported parent stock. From this statistics we may expect, we will be self-sufficient within the year 2010 in producing parent stock. In Bangladesh and a gradual improvement and increasing the number of poultry farm have been observed from 1980s. It is very much dreadful if the commercial poultry farm is not created. There hatcheries in the country are increasing their production day by day, so there should be a less crisis for day old chicks for farmers. Government has taken many initiatives to take care for the industry. Numbers of farms have been established in 1990 with bank support. There are 130 hatcheries of which 109 are in operation. Only 18 breeding farms are fully environment controlled. 85% hatchery produces only broiler and rest produce layer. Most of the Companies now have both hatchery and feed mill. Bangladesh has developed a model in which poultry is used as a tool of poverty reduction, fostering the idea of community group formation and skill development training regarding improved poultry husbandry practices rolled with micro-credit, for the rural poor especially the women to improve their livelihood, income generation and empowerment. The model comprises a set of mutually supported activities as a framework concept with the aim of poverty reduction, continual improvement and dissemination of husbandry knowledge and modalities. A group of entrepreneurs (enterprises) are established in the model as an integrated chain of production. But rigorous modality and ambitious assumptions leads to uncertain ability, in spite of its long term practice (1993-2004) in the country. Lesson learnt over the period of time during the course of implementation of the model in different projects pinpoints the need of adoption of a simplified version. Poultry Industry has become a destination for livelihood of 5.2 million people and its size may increase by five-fold. There are about 112,000 farms, 136 hatcheries and breeder farms, 32 automatic mechanized feed mills, 45 small and medium feed mills and more than 100 medicine companies in operation in Bangladesh. Having started in 1969 commercially, poultry farms have grown many folds over the past years. At the beginning mortality rate of chickens was more than 60 per cent as import of vaccine was not allowed. The growth has been fastest since 1990s though this industry was absolutely commercialized in 1980s. Now 100 per cent domestic demand of poultry is met by this industry. Poultry industry was declared an agro-based industry in 1994 and tax on land used for production was reduced to the rate enjoyed by agro-based industries. To boost this industry the government banned the import of one day chicks for commercial purpose and hatching eggs and eggs for eating from India. Poultry farms were exempted from income tax until the year 2005. Letter of credit (L/C) margin was reduced and made flexible for this industry along with 20 per cent rebate on electricity but the government’s initiative to prepare poultry policy was still under process which needed to be finalized immediately. The Charoen Pokphand Group is the largest business conglomerate in Thailand. Its chief subsidiary is Charoen Pokphand Foods, which did 116.5 billion baht in revenue in 2005, earning a profit of 6.747 billion baht. Aside from agribusiness, the family-owned holding company’s interests range from retailing, as the franchisee of Thailand’s ubiquitous 7-Eleven stores to telecommunications, as the owner of True Corporation, a mobile telephone, Internet service provider and cable television company. Charoen Pokphand traces its beginnings back to 1921, when brothers Ek Chor and Siew Whooy started the Chia Tai seed shop in Bangkok’s Chinatown. They imported seeds and vegetables from China and exported pigs and eggs to Hong Kong. Taking the Thai name Chearavanont, the family business prospered when it adopted the strategy of turning its seed customers into suppliers for an animal feed. In 1954, the company opened its first feed mill (it’s now the fifth largest feed-mill operator in the world), and it soon branched out into livestock operations, beginning with poultry and then swine. The company has grown into a global business, with more than 250 subsidiaries in 20 countries, including China, where it is known as the Chia Tai Group. The CP Group was formerly a partner in the Tesco Lotus venture with Tesco of the United Kingdom and in Makro stores with that chain’s Dutch parent company. The company sold its stakes in those enterprises in 2003 due to its post-1997 crisis policy to focus on 7-Eleven, in which unlike Tesco and Makro it owns a majority, as its flagship retail arm. However, the company kept its shares in Tesco Lotus outlets in China. The company was famous for horizontal integration expanding into several business lines with 4-5 SET listed companies. After the Asian financial crisis in 1997, C.P. hired Price Waterhouse as its consultant and consolidated into three business lines under its main “brand names”: foods (C.P. Foods), retail (7-Eleven), and telecommunications (True). Each of these companies has a separate listing but the other listed companies were merged into CPF. Unusually for a Chinese family, C.P.’s head, Dhanin, is the youngest sibling. He is known for his vision and compromising nature, and for his belief in geomancy. C.P.’s headquarters is located in “C.P. Tower” on Silom Road, which it purchased over 20 years ago for about 200 million Baht. Cultivating and processing crop products for animal feed. Providing integrated communications and content services through fixed, wireless and cable networks. True Corporation Public Company Limited (SET: TRUE) was established in 1990 as TelecomAsia. True controls Thailand’s largest cable TV provider, True Visions (formerly UBC, a merger of True’s UTV and Shinawatra’s IBC Cable), its largest ISP ‘TrueInternet’, and its third-largest mobile operator ‘TrueMove’. True has been a leader in introducing broadband into the country and has about 80% market share. Other than that true also controls the mobile pay company ‘TrueMoney’, in addition to that ‘TrueVisions’ ‘TrueAF’ is now Thailand’s most watched show (from June – September), earning a vast profit from concert votes. True’s cell phone operator, TrueMove, is right behind DTAC (second largest operator), thanks to fellow “True” companies that have joined forces. True is now Thailand’s Largest Convergence Company, and if counted all sub companies, is larger than DTAC and AIS. CP-Meiji dairy, with Meiji Dairies of Japan. CP 7 Eleven (SET: CP7-11) with 7-Eleven of Japan. On October 19, 2007, CP7-11 was re-named “CP All Public Co. Ltd.”. CP’s integrated agribusiness, positions it to meet the world’s changing lifestyles need for affordable, nutritional, and high quality food products. Consisting of five divisions (Seed, animal feed, livestock production, further processing, and trading), its horizontally and vertically integrated agribusiness enables it to create value by supplying needs anywhere across the world. One of the largest animal feed producers in the world, CP’s feed manufacturing dates back to 1954, as an offshoot to its original seed supplying business. From its initial development to today, CP’s local and international feed mills, produces food for our livestock consisting of poultry, swine, and aquaculture businesses. Its poultry, swine, and aquaculture businesses (CP Foods) were formed through strategic partnerships with leading international livestock organizations over 30 years ago. Today, its operations enables it to breed various livestock, operate farming systems, process meat, and conduct mass food production in both commodity and value-added forms for both local and international consumption. In addition, its agribusiness and food industry business has cleared internationally recognized health and safety regulations, which includes GMP, HACCP, and ISO 9000 and 1400, enabling it with the ability to provide consumer products that are safe and hygienic. C.P. Bangladesh Co. Ltd. is a sister concern of C.P. Group Thailand. C.P. Bangladesh Co. Ltd. is incorporated in Bangladesh on 14th January 1999 doing business in the Agricultural industry, Poultry sector. Though C.P. Bangladesh Co. Ltd. is not in Bangladesh many years, but in this shorter period it has established its own Feed mills, Breeder Farm, Hatcheries, G.P. farm, fish feed mill all over the country. C.P. Bangladesh Co. Ltd. has established with a vision “To be a leader in Agro-business industry in Bangladesh” and each day it is getting closer to its vision. C.P. Bangladesh Co. Ltd. focuses on quality and productivity. C.P. Bangladesh Co. Ltd. prepares them for the future by building world-class facilities, Transferring technology, trained up efficient management. They look at the future with confidence. C.P. Bangladesh Co. Ltd. has three hatcheries in Bangladesh situated in Dhaka ( Kaliakoir), Bogra and Chittagong. C.P. Bangladesh Co. Ltd. has the production capacity of 12 lac broiler and 2 lac layer D.O.C per week. C P now produce popular broiler breed Cobb 500 and Ross 308 and Isa brown for layer. It has also started its fish hatchery producing Tilapia fry. The Group is moving towards integrated poultry production, and is establishing broiler farms. At present, they are producing 80,000 broilers per week. C.P. Bangladesh Co. Ltd. is producing quality pullet for the farmers. the farmers can reduce there egg production time by using pullet. C P feed is well known in Bangladesh for its premium quality. The company follows a strict policy starting from collecting its raw material through feed producing. The company is uncompromising about its feed quality. Same goes to its hatchery management. C.P. Bangladesh Co. Ltd. is run by the Thai management along with Bangladeshi personnel. The company has Thai expert in every crucial sector of its operation. C P Bangladesh Co. Ltd. has started to market animal health product recently. It has been planning to start its food business very soon. Marketing mix of C.P. Bangladesh Co., Ltd.
Feed price: – C P set a premium price for its feeds. C P has successful to establish its feed quality as benchmark in this country. C P never lowers its feed price than other company to catch market. C P wants to remain the price leader in the market. Chick’s price: C P wanted to set a premium price for its chicks but could not establish due to the nature of the product and the nature of the market of Bangladesh. Here the chicks demand is very much unstable. And the C P is not the market leader of chicks market so it has to follow the price set by the market leader most of the time as it sets the market price. C P follows the traditional system of distribution of the poultry industry. It has distributors all over Bangladesh. It has try to establish dealer points starting with the poultry zone’s of the Bangladesh like Saver, Gazipur, Narayangong and the major district. Within five years it has dealers in every district in Bangladesh except those districts without poultry market. CP gives two mainly two types of dealership, 1) Independent dealer 2) Direct feeder. A direct feeder can use CP product only for his farm but can not sell outside. An independent dealer is mainly a reseller to the farmers. It is the job of the independent dealer of that district or area to collect booking for chicks and provide feed for the chicks in that area. An independent dealer can sell to other dealers or sub-dealer to a remote or small market. The independent dealer can use feed and chicks for his farm also. CP has established its feed mills in the convenient places. It has three feed mills in Dhaka (Saver), Rajshahi, and Chittagong. It has three poultry hatcheries and one fish hatchery. They are in Dhaka, Borga and in Chittagong. The location of its feed mill and hatchery gives it a competitive advantage. To sell its product CP make various promotional activities. By the policy CP believes less in advertisement as truly poultry product sale less depends on advertisement or the customer seldom move by the advertisement in this industry. Still CP places its advertisements in the poultry Magazines. C P takes participation in the poultry fair and other events. C P focuses on the direct customer and tries to keep contact with them directly. Group selling meeting and seminar is one of the main promotional activities of C P. Along with various technical knowledge cp distribute its product information to the customer and offer various bonus scheme for short period. C P runs several promotional activities for it dealer all the year round. It offers different promotional facilities for the dealers providing a target sale. One of the lucrative offers is the pleasure trip to Thailand for the dealers. Dealers can stay for at least one in a five star hotels and visit the places of Thailand. Kazi Farms Limited was established in 1996 as a hatchery of imported eggs. The following year it started its own parent farms, and in 2004 production started in its grand-parent (GP) farms. In addition to producing breeder feed to meet it own requirements, in 2006 it established the largest and most advanced feed mill in the country with technical assistance from Cargill USA and Buhler Switzerland. Kazi Farms Group is the grand-parent franchisee of Cobb-Vantress USA for Cobb 500, acknowledged world-wide to be the best broiler. It also has a smaller number of grand-parents of the popular Ross broiler from Aviagen USA. Kazi Farms Group was the first exporter of hatching eggs and day-old chicks from Bangladesh. Kazi Farms Group has over 50 broiler parent farms, layer parent farms, broiler grand-parent (GP) farms, hatcheries, feed mills and sales offices in different locations throughout Bangladesh. Kazi farms has the largest D.O.C production capacity in Bangladesh by producing more then 20 lac chicks per week. Highest number of chick production. Hatcheries are located in the strategic location. Increase in the production of other company. Founded in 1991, Aftab Bahumukhi Farms Limited was established at Bhagalpur, Bajitpur in the district of Kishoregonj, about 110 km northeast of Dhaka City. Its main objective was to provide and make available good and hygienic sources of poultry protein, dairy product, fish, vegetables, cereals etc. AFTAB POULTRY maintain parent (Breeding) stock in own farm & through contract growers. Producing 2 million day old chicks per month in a modern Hatchery. Producing broiler chicken through contract growers, processing chicken by modern poultry processing plant. Marketing & distributing Day Old Chicks, Live, dressed & portioned chicken throughout the country by its own distribution system. POULTRY FEED MILL was first established primarily to provide balanced feed for the ABFL own poultry. It was later expanded to meet the demand of poultry feed for the larger section of the growing market. At present ABFL has 3 feed mills with capacity of 10000, MT/Month & distributing balanced feed to the farmer throughout the country by its own distribution system. ABFL also has taken a venture to establish another fully automatic feed mill with capacity of 10000 MT / Month at Rupsi, Rupgonj, Narayangonj. AFTAB FISHERIES is very much in rudimentary stages of development . It has at present 25 acres of water area and plans to develop a water area of 200 acres in near future. It products are marketed in Dhaka through its own sales center. AFTAB AGRICULTURE involves some highly prospective land areas in Bajitpur, Kuliarchar. ABFL working with Chinese company for introducing hybrid rice seeds in Bangladesh. A concern of one of the biggest group of Bangladesh. Very well known brand name. Lack of consistency in the marketing. Strong competition from local companies. This farm is one of the biggest farms of Bangladesh. They want to maintain a good quality product and to be in a competitive position in the industry. They always try to offer a competitive good quality product in comparison with the market leaders. As well as maintains the competitive quality breed and technology with response to its market leaders. DOC Broiler, DOC Layer, Feed mill for self-consumption and sales. DOC Broiler, DOC Layer, Feed mill for self-consumption and sales. Nourish started its business with a hatchery and soon they establish the feed mill. Due to their good will for chicks quality, they capture a good share of feed market very fast. Nourish is one of the fasted growing company in the poultry sector. But its growth is now stalled in position due new investment and less effort in the marketing. To increase feed market share. Paragon Poultry Limited (PPL), a private limited company, is one of the largest integrated poultry farms engaged in the production of day old commercial chicks, table eggs, and poultry feed. PPL started its journey in 1993 with its commercial layer operation at Gazipur. Over the past 9 years, it has expanded its operation into production of day old chicks and poultry feed. PPL has been the pioneer in introducing state of the art technology and advanced know how in poultry farming and hatching industry in Bangladesh. PPL has also been one of the leading poultry feed manufacturers in Bangladesh. It has been successful in establishing its brand name in the market by maintaining a rapid market growth and gaining buyer confidence. As Paragon understands and believes the endless effort should be continued to keep the highest standard and the leading position in the market. Godrej is a pioneer in the packaged meat business in India. It is also the market leader in the poultry industry, and the owner of ‘Real Good’ brand. ACI and Godrej have a joint venture in Bangladesh to set up an Integrated Poultry Project. Under this project, ACI Godrej Agrovet has already set up a feed mill at Sirajganj. This is fully automatic pellet poultry and fisheries feed mill, which uses technology from Jiangsu Muyang group of China. The company has also set up a hatchery at Joynabazar, on the Dhaka Mymensingh road, with technology from Godrej. The plans for this project also include establishing Grand Parents and Parent Stock breeding farms. The investment in the project is Taka 8 crores, with ACI Limited having 50% shareholding of the company. New Hope” one of China’s biggest animal feed producers already producing finished feed in Bangladesh. New Hope began production at its newly-built feed mill in Gazipur earlier this year and has the capacity to become the biggest in Bangladesh. New Hope has already invested $5.0 m in Bangladesh and is sole owner of the new 30 tonne/hour (t/hr) capacity plant. New Hope Feed Mill Bangladesh is a subsidiary of New Hope Group. The New hope Feed Mill is now producing and selling poultry feeds under its New Hope” brand. New Hope has entered the Bangladesh market at a difficult time, facing double trouble from the 16-month long outbreak of H5N1 avian influenza and high input costs that are stopping some producers from re-starting business. The production of poultry, like any other production, cannot make any sense, until and unless they are made available to the target customers in the right time, at the right place, with the right price. Here comes the matter of marketing which makes all these possible. Among all other aspects of marketing, this present study concentrates on the distribution of poultry products in Dhaka City with particular importance on the marketing cost and profit of the channel members. The term “poultry” implies a wide variety of birds and species, but here, for the study purpose, its limit the term “poultry” to mean commercially- produced broilers and farm-produced eggs. To grow the broiler the farmer needs to take huge care for the broilers. A comfortable living space is very much necessary for the broilers. The broiler chickens normally grow in bed. The position, width, length, height, ceiling, floor, door of the house where the broilers live should be appropriate and scientific to produce chickens. A standard measurement for broilers according to time (age), heat of the room, weight, ventilation, and living space size is given. It is very much important for the farmers to select the strong and disease free chicken. Because, good chicken (one day older) can ensure nice production of broilers. Here the present demand for poultry feed of our country is provide. The necessity of feed for 2007 can be assumed from the statistics. The Layer chickens are grown for eggs production is very much sensitive in environment. The red layer laid red (brown) eggs and white fathered layer laid white eggs. But there is no difference between these red and white eggs in nutrition value. Eighty Weeks Older Layers would be sold out in the market as meat. An entertaining matter is the people of Bangladesh prefer brown eggs rather white eggs. But the people of USA like the white eggs very much. The preference depends on the cultural thinking process nothing another reason. As the eggs and chickens are very much essential in our daily life, the price of these products is determined according to the market demand. The people of the country have enough purchasing power to buy chickens and eggs for their families. Retail Price in Dhaka City: In June 16, 2007 it has get some retrial price from different market of Dhaka city. The price of the poultry product is moderate high and this is not a problem for farmer or intermediaries to get reasonable profit from the market. But if more production is possible then the price will be low for the consumer. In the early months of 2007 the price was decreased for the threat of Bird Flu. For the convenience of study the data only collected from Dhaka City only to understand the pricing system running in the broiler market. Here it is assumed there are two members between poultry farmer and consumer, they are wholesalers and retailers. This pricing is around the real market price. We see wholesalers receive 10.53% of selling price and retailer receive 6.91% of selling price as profit. Broiler producers take around 20% profit of selling price and they contribute a lot to produce broilers. Farmers have financial risk and uncertainty of reasonable profit. The following provide us a general look about the broiler price at present time. Few years before, it was 36tk for a dozen but in June, 2007 consumer needs to pay 48tk per dozen. The price is increasing very much frequently because of increasing cost of feeds, materials and other production materials. The intermediaries also take more profit now the time. The Layer farmer need to give feed to the each layer chicken about 1tk. More vaccination cost needs to make the chicken safe. In the given price information we see about 15% profit of final price has been taken by the retailers. The wholesaler takes 5.24% of the selling profit as profit. The intermediaries cost for feeding & case, weight loss & damage of chickens, transportation, tools, rent & labor. The retailer as well as the wholesaler needs to occupy these costs which take approximately 20% of final price. Real Life Example: To better understand the Marketing cost and Profit margin for Different Intermediaries we can see the AFBL’s costs of Broilers and Farm eggs. This is measured in the late 2006 by AFBL. There is no selective distribution system in selling poultry products. The retailers purchase eggs or chickens from previous intermediaries and sell in the final consumers. The transportation is very much simple. But a restricted form of distribution is observed in the initial stage between hatchery owners and poultry farmers in this industry. There are many parties involved in the poultry production to marketing activities. The village poultry reapers collect day old chicks from chick reapers. The village poultry reapers also need the help of other party for vaccination and medicine supply. The community poultry workers (CPW) help the poultry farmers by providing the information and economic leverage. It is very difficult to identify the all things of marketing and distribution of the whole industry about poultry. So it will be discussed about the possible distribution channels of broilers and eggs. There distribution channel of poultry are as usual. There are two type of distribution channel are observed for poultry product. One is the distribution channel for broiler and another is distribution channel for eggs. Here some terms should define. Broiler farms are those farms that produce eggs or broilers. Institutional buyers are the organization which serves the product to its clients. Such as school canteen, universities cafeteria, hotels, motels, restaurant etc. Wholesalers and retailers are middlemen of the channels. Suppliers fulfill the demand of institutional buyers. And consumers are who purchase poultry product for their own consumption. These all are literature review. The price varied from the farm gate to the retail shop in large scale. One can buy hundred eggs from Shaver by 280tk but if he/she comes in Dhaka city then he/she has to pay about 400tk for this. For that reason the instructional buyers purchase from Layer farmers. The normal individual consumers depend on the wholesaler and retailer. So the price differs huge from the initial price by 30 or more percent. Institutional buyer relies on suppliers to get necessary supply. And some layer farmers cannot fulfill one institutional buyer’s demand. In the poultry sector the distributors specially takes a huge amount of profit. But they keep the products just for few days. Retailers and wholesalers are very much helpful to make the poultry product available all over the country. So we never support to eliminate the intermediaries from the poultry product distribution channel. But the intermediaries should have prohibited taking high profit because of their less risk talking tendency and low time involvement. Distribution is easy in poultry and it is very much essential to send the broiler in the consumer in time. Because, keeping cost of more day expense unnecessarily. And eggs are also perishable so that it should be marketed as early as possible. For these reasons market distribution system should be fast and forceful to gain a profitable poultry industry. As many as six channels, from one tier to three tiers, for the distributing of broilers and five channels for eggs have been identified in Dhaka city markets. Distribution channels of broiler consist of layer farms, wholesalers, suppliers, retailers, and institutional buyers. Suppliers are those who have no permanent shops of their own but distribute goods mainly to the institutional buyers with their own transport vehicles after purchasing from the wholesalers or broiler farmers. Institutional buyers which include hotels, fast food shops, department stores, and other residential halls and hostels in Dhaka city area, obtain their supply of broilers and egg either from the farmers. Aratdars/wholesalers, retailers are the suppliers. But in case of eggs a radars are the prime source of supply to distribute them in Dhaka city markets through wholesalers, retailers, suppliers or institutional buyers like general stores, department stores or other one-stop shopping centers in Dhaka city. Dressed broilers are mainly distributed through the channels consisting of Farmers, institutional buyers, and Consumers. The major sources of supply of broilers in Dhaka city are the surrounding districts like Gazipur, Savar, Narayangonj, Norsingdi, Munsigonj, and Kishorgonj. Among these, Savar, Gazipur and Norsingdi are the largest sources of supply. It is also found that some small farmers of Dhaka city supply broilers in the city market. Promotional Situation: If is talked about the promotion activities then there is few effort are exist in the Bangladeshi market. Because of, no branding is developed about the eggs and few branding in chicken (but not any promotional activities) in our country. And you see the poultry feedings and seed chickens have huge branding activities but if you talk about the promotion on there then you will see no promotional activities without personnel selling. We expect for the near future promotional activities will be observed in poultry sector largely. And there may be chance of branding of chicken and eggs as well. Branding of dressed chicken has already been introduced in Bangladesh. But Internet ads are seen in web sites by foreign large poultry farms. BangladeshPoultry.com is the best way to the largest poultry market of Bangladesh. Through this site our poultry entrepreneurs and technologists will get a chance to interact with national or international counterpart colleagues engaged in poultry related business, development, education and research. The marketing blend works in the poultry industry of Bangladesh like this way. There is no product differentiation of different farms. Small scale production from small farmers and price determined according to market demand and supply. The distribution system is very much mass targeted and there is no promotional effort as to say. It may expect that there will be an enormous change in poultry industry of Bangladesh within few years. Bangladesh is a large market of poultry product because of its population. We need to produce more poultry to serve our domestic demand. To prove the high domestic demand there are some statistics can be shown. Average consumption is much lower then other countries in our country. So we can say we have huge demand of chickens and eggs. The poultry farmers can produce more broilers and eggs to satisfy the present demand insight the country. Comparative price of chicken meat & beef (Tk./kg) Last 7 years’ price (Tk/kg) trend of dressed Chicken meat and Beef: The following chart shows us the comparative price between chicken meat and beef. Before 2003 the price of chicken was higher than the price of beef. In 2007 we see the price per kg beef is 180tk and the price of chicken meat per kg is 95tk. So meat of chicken has huge demand. Growth of commercial poultry in Bangladesh: We have no statistics of 2006 about the growth of commercial poultry in our country. But it is possible to estimate about the raising trend of layer and broiler chicken. Poultry is an emerging and important sector that has been contributing progressively to our economy for the past decade. Poultry is one of the fastest growing and most promising industries with the brightest of futures for our country. Poultry sector are playing a very vital role in the reduction of poverty, malnutrition and unemployment problems of our country. Poultry farming is important because relatively cost effective investment. The house wives can create a small poultry farm insight their home. And this can support additional income for their families. And small amount of loan can be received from government. We can develop the poultry as small industry as well as large industry in our country. Family poultry production can help in malnutrition to the members. One can be self-employed and create employment for others through poultry production. Consumption of meat in developing countries grew by 70 MMT (Million Metric Tons) from 26 MMT in developed countries. So it is an opportunity to export poultry products out side the country. Bangladesh stays beside India, Nepal, China, Japan those are large emerging market for poultry. Now it is the appropriate time to capture the big market. Another thing is that the neighboring countries are not so much alert to the poultry specific quality (certain nutritional value in defined percentage). So we should go for mass production and try to export outside the country. In the meantime we can develop the basic quality of poultry products. The prepared food can also export in the foreign country. Dressed chicken is the most essential food item in the European countries. We could supply this in Middle East as profitable operation in international market. It is not impossible for the part of Bangladesh. There is a lot of opportunities to sell poultry product specially meat in the foreign countries and earn a lot of foreign exchange. The poultry industry has the power to earn money from India, Pakistan, Nepal, Malaysia, Indonesia, and countries of Middle East. We may export dressed chicken, fresh meat, or prepared food by chicken. There may be some chance to export day’s older chicken and developed quality eggs for breed day older chicken. So we should provide effort to export poultry in foreign countries as early as possible. Avian influenza (bird flu, avian flu) is caused by a type of influenza virus that is hosted by birds, but may infect several species of mammals. It was first identified in Italy in the early 1900s and is now known to exist worldwide. A strain of the H5N1-type of avian influenza virus that emerged in 1997 has been identified as the most likely source of a future influenza pandemic (virus). Strains of avian influenza virus may infect various types of animals, including birds, pigs, horses, seals, whales and humans. However, wild fowl act as natural asymptomatic carriers, spreading it to more susceptible domestic stocks. Avian influenza virus spreads in the air and in manure and there is no evidence that the virus can survive in well cooked meat. Bangladesh’s poultry industry is highly vulnerable to Avian Influenza virus, dreaded bird flu, due to its geographical location and dependence on chicken imports. It is a dangerous threat for the poultry industry of the whole world. But Bangladesh is affected by bard flu and the proper authority should take proper action to take away it and the consumer will be well informed about the disease. Already Bangladesh government refused all type of import from the foreign country. Since some 20 per cent people of the country depend on poultry industry and they need appropriate preventive measures against Avian Influenza that can be transmitted to human body. The Avian Influenza, which broke out in 10 Asian countries last year, totally shaking their economies; Bangladesh is also fall into the holocaust this year. After all, a standard guideline for this industry is needed and appropriate support to the industry may save huge amounts of foreign exchange and it may pave the way of earning money by export as export started. If we fail to protect the bird flu threat from the country as early as possible, there may a chance to destroy the industry from Bangladesh. Now we should try to reduce the amount of misplace. The dreaded Avian Influenza virus, better known as ‘bird flu’ has been detected at the Biman poultry farm complex at Savar on the outskirts of the capital. The virus that has claimed many lives and played disaster with poultry industry in some countries of Asia and Europe was also detected in neighboring India and Myanmar only recently. So, despite all the defensive measures, its entry could not be stopped finally. The authorities concerned have reportedly taken a few emergency steps to stop spread of the disease and advised the people not to be panicked by the disease and continue consuming cooked poultry meat and boiled or fried eggs as usual. Fortunately, until now the disease has not been detected among the poultry birds in other parts of the country. The authorities, meanwhile, have culled more than 35000 poultry birds within a couple of days. Besides, decision has been taken to destroy all poultry birds within one kilometer radius of the Biman poultry farm at Savar. The members of the armed forces have cordoned the risk zone to stop any attempt to smuggle out poultry birds from there. When Avian flu appeared in a pandemic form in China and some other Southeast Asian countries about a couple of years back, Bangladesh with the active help from the World Health Organization (WHO) and the Food and Agriculture Organization (FAO) started taking precautionary measures and formed a national task force on bird flu in 2005. Besides, an action plan, styled, National Avian Influenza and Human Pandemic Influenza Preparedness and Response Plan, Bangladesh 2006-2008, is in place to combat the disease in line with the FAO and WHO guidelines. Under the guidelines, the members of the taskforce have restricted movement of humans and animals near the bird flu affected areas. The health related safety and security of the people involved in the operations of the poultry firms is always a concern, for, contrary to the claims of the government about adequate safety measures against the Avian flu, they do not give much importance to the problem. The authorities can cull poultry birds and restrict movement of humans and animals in the affected areas but they can hardly change the habit of workers handling poultry birds carelessly. So, the element of health risk is very much real in the bird-flu infected areas. What is more important is the possible negative effect on the country’s Tk 50 billion poultry industry which has been doing fairly well with the necessary supports from the government, notwithstanding the fact that the consumers are yet to get any price-relief out of the duty rebates given on poultry-sector related imports. In spite of the assurances from the authorities the sector might go through a turbulent time because of the detection of Avian Influenza virus in poultry birds that can be easily transmitted to humans. But much would depend on the government’s ability to stop the spread of the disease in poultry birds of other areas of the country. The news about anyone being afflicted with the virus might stir panic among the population and play confusion with the poultry industry in particular. Outbreaks of avian influenza in the poultry industry cause devastating economic losses and is generally controlled through extensive culling of infected birds. Alternative strategies also use vaccination as a supplementary control measure during avian influenza outbreaks. There is no treatment of avian flu till now. But flu can be controlled by vaccination. The central veterinary organization can ensure the proper action for vaccination program. Avian flu spreads out through chickens, ducks, doves, foxes, or wild birds. The symptoms of the disease depend on virus and carrier birds. The virus of this disease can be spread out by different ways. We can show the ways of affecting the bird flu by two types. One is direct way and another is indirect way of affecting bird flu. In direct way the farm is affected by its domestic birds or wild birds. Human beings or vehicle can be affecting indirect way. Avian Flu can destroy the whole poultry industry. We have to protect our poultry from avian flu. Every parties related to the poultry has some particular duties and responsibility to get relive from the avian flu. As the flu has already flown in some towns and cities of Bangladesh, we should try to protect the rest territories from the avian flu. The related parties of poultry industry are consumers, distributors, farmers, Government and NGOs etc. Every party should do their own activities to get out from danger of avian flu. The farmer should ensure natural security for the chickens. Natural security means the keep chickens free from germs and other hazards. Actually it is an easy concept. The natural security is just an effort to keep the farm neat and clean. This will help the farm keep out not only from avian flu but also other diseases. So to ensure the natural security is very important. There is no certain time like summer or winter for avian flu. It can affect the farms any time. Even this disease can observe if there is no where it began. When any area besides the farm are breaking out the avian flu, the chance of flu become increasing. The flu may be flown through human beings or birds or any type of animals. To keep the chicken well means free from germs. In the terms of poultry we should give sufficient clean water and food. Necessary housing of the chicken is another requirement for keeping farm well. Provide proper medicine in time and vaccination. If the chicken does not in good condition then the chicken may fall in diseases or the production eggs and meat may decrease. It is really difficult for small scale production to keep the chicken of farm in a safe environment. Because maintaining natural security becomes impossible for small farm. So the farmers can follow some rules. Poultry should keep in a locked room. The get together between hens and cooks should be controlled by time and need. The farm should be free from other birds. Especially the farm should not establish in bills areas. Different types of birds like winter guest birds, ducks and other national birds may cause for avian flu. But many of the farms establish in the bills area in Bangladesh. We see the saver is full of cannels and bills and attract of avian flu started from that place. If any affected chicken can be identified then the chicken should be keep out from the disease free chicken. The farm keepers should be got them free from germs before entering into farm. The materials coming from affected area can harm to a safe farm. The entrees of neighbor or visitors entree should be prohibited. The distributors are kept away from the farm environment. Even the family members who come from outside should ban to entry without cleanness. The doctor or the vaccine provider who has come from other farms can carry the germ of avian flu. New day old chicken can bring the avian flu. The chicken are brought in market for selling are backed could be a cause of flu. Dogs and cats which are moving insight the farm can carry the flu. And we see in the exhibit that the motor vans or carriers of poultry product may be the possible cause of flu. To purchase of natural fertilizer from affected farm can carry the flu. Very often this maintenance may be difficult for poultry farmers but if they want to ensure their profit then these are needed to do. The farmers need to change their previous habit. Every time it should be remember that the flu can be flown by the farmer himself or outsiders. The feedings of the poultry should be kept in a secure place away from the living home. Use soap and other chemical to protect the clothing clean and germ free. The farmer may use different shoe for entering in the farm. Germ killer should spree at least two times per week. The farm can delay to farm poultry in the time of breaking out avian influenza. The weak chicken should keep in different place from the strong chicken. It should not wise decision to keep the newly purchased chicken with older one. It is difficult to the part of farmers to identify the flu by the farmers. But two things can make clear about the virus of avian flu. Firstly, unexpected death within 24 hours of strong chicken may be the cause of avian flu in an affected territory. Secondly, it is seen that the average death of poultry is more than 5% of the farm. If farmer saw the cause of death of the chicken may be avian influenza the farmer must inform the proper authority. Don’t try to sell the flu infected poultry in the market. Don’t through the dead chicken into the river or pond. The dead chicken should be packed and tomb in the ground by making a hole. And the informed district poultry officer will visit the farm and kill the chicken as need to save the others. The killed chicken will packed and route in the previous way. Another way to route the dead poultry is burnt by fire. But it can pollute the environment. After cleaning all the materials used by the infected chicken the farmers can farm new chicken after 3 weeks. Avian influenza can be controlled if the information can get at the right time as far as possible. This is now reality to maintain the farm with the threat of flu. In summing up the chapter it can say avian influenza or flu which can enter in human body as bird flu is very much dangerous of the poultry industry all over the world. But if we follow the rules of avian flu protection then this can reduce our loss. According to the Department of Livestock Services, over 2.2 million poultry were killed in 4 badly affected districts in the coastal area, and a total of 27 million poultry were affected in the devastating cyclone in 12 southern and southwestern districts. Additionally, it is also feared that a huge number of poultry are feared to have died due to various post-cyclone infectious diseases. As part of long-term measures, the livestock department has said that it will develop infrastructure for poultry farms. The fierce cyclone hit Bangladesh’s southern and southwestern coastal areas in mid-November, leaving over 3000 dead and millions affected in 30 out of the country’s 64 districts. Disease is defined as a departure from health, and includes any condition that impairs normal body functions. Disease results from a combination of indirect causes that reduce resistance or predispose an animal to catching a disease, as well as the direct causes that produce the disease (Damerow, 1994). Direct causes can be divided into two main categories, infectious and non-infectious. Some of the non-infectious conditions may result in reduced immune response (e.g. problems with nutrition), or increased contact with infectious organisms (e.g. poor housing and management), and will lead to increased incidences of infectious diseases. Most other diseases Less mortality Hamper egg production and growth. Incur handsome medicine cost. Birds that are fed an adequate diet made up from a good commercial feed are unlikely to suffer from nutritional problems unless there are additional factors involved, such as diseases that result in diarrhoea or otherwise interfering with the digestive system. Village, backyard or scavenging poultry on the other hand are subject to the availability of food in their normal environment, which may or may not be deficient in vitamins, minerals or other important dietary component. Using good quality ready feed can reduce nutritional problems. By purchasing cheap feed farmer provide mal-nutrition to the chicken and loss production. Heat stress (any extremities in temperature, both hot and cold). Overcrowding, perhaps due to poorly designed housing or inadequate facilities. Fighting for space at a feeder or drinker will result in injury, and in reduced growth or productivity. Overcrowding increases the exposure of disease causing organisms and often increases the opportunity for the growth and spread of these organisms. Moving, e.g. from a hatchery to farm or from one building to another. Vaccination. Negative reactions from some vaccines may occur up to 10 days after inoculation. Temporary or longer term, shortages in feed or water. Changes in feeds or feeding methods, or changes to a daily routine. Poor nutrition. Inadequate diets may result in deficiency diseases and general lowering of resistance to infection. Parasites (both external and internal). They weaken the bird and provide additional opportunities for the introduction of other disease causing organisms. Physical disturbances such as excessive noise or other unnecessary activity. A condition caused by high temperatures, especially associated with high humidity and low air speed. Symptoms include: Panting, legs and wings outstretched, increased thirst, reduced feed consumption, and reduced egg production. Birds regulate their body temperature by controlling heat loss through their skin and feather cover, and through evaporation by panting. A mature chicken starts panting when temperatures reach about 29 or 30°C, with chicks being affected at higher temperatures. Panting causes a chicken to exhale large quantities of carbon dioxide and this increases the pH of the blood. This causes physiological changes that result in stress, and chickens may stop eating, lay fewer and smaller eggs (with thinner shells). Young birds may stop growing. Increased air circulation in poultry housing is important, and the provision of adequate shade from the sun is vital. Provide extra water supplies, and make sure that the water is clean. Cold may also be a serious problem, particularly for chickens. Even freely ranging, scavenging poultry require safe secure roosting areas, and nesting areas, as well as suitable shelter from the elements. More intensive production systems require all this, with greater attention given to the precise requirements of the birds. Cannibalism is a problem that is particularly associated with large poultry flocks where birds kept in close confinement peck at each other. This can produce significant mortality in the flock when injury results. It will also cause a decrease in egg production as the hen-pecked birds become stressed. Nests and nesting areas not dark enough. Crowding, and high densities of birds in areas where they are unable to get away from each other. Boredom or lack of exercise (this is more likely in cage birds than in free range birds). Feed and water troughs too few or too close together (crowding at the feeding stations). Feed that is too high in calories and too low in fibre (they quickly satisfy their nutritional needs and get bored). Feed that is deficient in nutrients may result in the birds becoming irritated which can subsequently lead to cannibalism. This is likely to be in the protein levels or an imbalance of sodium. External parasites may cause a chicken to pull out its own feathers, and draw blood. This may attract other birds to peck at the area. Injury or bleeding from other causes. Injuries, when left untreated, are likely to result in infections. Injuries to the birds therefore need to be avoided, and good management practices coupled with well designed housing is an important preventative measure. Overcrowding will commonly lead to aggression between birds – with a high probability of injuries to one or both birds. Similarly, a lack of space at feeders and drinkers will also lead to aggression and injury. Overcrowding will also lead to stress, and stress can lead poultry to “pick” at one another – eventually resulting in cannibalism (see above). Free range, scavenging and backyard poultry are much less likely to suffer from problems of overcrowding than intensively reared broilers or layers. However, poultry housing still needs to be constructed to to provide a good environment for the birds – both while roosting at night and when nesting and egg laying. Poorly constructed housing may result in stress and injury. Poisoning should not be a problem with chickens, but common sense needs to be used in keeping the birds away from pesticides, herbicides, rodenticides, fungicides, and also from treated seed intended for planting. Other than accidental poisoning with such chemicals, the most likely cause of poisoning is probably from mycotoxins produced by fungi or moulds growing in feed. Rodents are attracted to poultry houses by the availability of feed, in feeders or spilled on the ground, as well as by the availability of water and by protection and shelter. Rodents can spread diseases, for example through droppings left in feed troughs. Rodents can be a particular problem where there is a raised floor that provides a dark and protected space offering nesting sites. Quite apart from the risk of disease, a rodent problem represents a financial loss through wasted feed. Chickens are natural predators and will catch and eat smaller mice, but the more agile species and the larger species (e.g. rats) are not controlled by chickens and where there are problems, rodent control measures will be required. Consumer Survey: This paper surveyed on about one hundred people and has taken much information from the customers who buy eggs and meat for their family. The given findings are discussed bellow by question gradually. Here 80% people prefer the layer eggs and 20% people for local eggs but local isn’t available for that they are bound to buy the layer eggs. About 40% prefer local chicken, 30% like Broiler and 10% like layer and rest of the respondents like both broiler and local chicken. People are anxious about price of eggs. Here maximum consumer said price is too high and some said medium because of the market condition and no one admit about the low price. Comments are as similar as the price of meat. The market get 60% people said eggs and chicken are available but price is high and on the other hand 40% people said not available. It is observer that 50% people have much more confidence about nutrition but 40% people said about on nutrition because of feeding schedule. Maximum respondent said not for taste but broilers are available, on the other hand maximum preferred the local chicken. The result of survey shows that 60% buy more than one kg/s and 35% buy one to three kg/s and 10% buy less than one kg/s. 10% purchase more than 100 eggs and 30% buy 50 to 100 eggs and rest of the respondent buy less than 50. Maximum people like dressed chicken because to save the time. Producers Survey: Family poultry keeping is very popular in our country. About 90% households have domestic poultry (i.e. chickens, ducks, pigeons, etc.). The number of commercial poultry producers is increasing day by day in Bangladesh. The given findings are discussed bellow by question gradually. Around 70% farmers are broiler farmer. After the bird flu attack the number of layer farmer reduced drastically. Most of the broiler farmers rear 500-1000 bird. Bigger than 5000 bird farm is rear. On the contrary most of the layer farmer rear 2000 bird. Farms with more than 10000 birds are often found. Near about 90% of the broiler farmers prefer ready feed due to its ease of use. Layer farmers are still fond of home mix feed, popularly known as loose feed. Layer farmers are more cost conscious and they prefer to make their own feed but lots of layer farmers especially small layer farmers prefer ready feed. Of the ready feed user most of the broiler farmer prefer pellet feed. Where as most of the layer farmer use mash feed. A few layer farmer use pellet feed at early stage of the bird. To make choice among the three categories responded seems to be confused. All the responded says they prefer quality over any other things but expect the product to be cheap also. No body seems to ready to accept credit as a selector but truth is credit facilities plays an vital role in their selection of product. Almost 100% farmers recognize CP. Unstable: Very much unstable. Last six month the market sees a total flip the price table. Because of the bird flu rumor the company suffered a huge loss as the farmer discontinue farmer for a while. The price of the D.O.C decline less than an egg price. But with in six month as soon as the bird flu fear withered the price of D.O.C soar up to taka 50. The farmers had to buy the chicks more than 50 tk as the demand was much higher than the production. The farmers are very sensitive to the market price of the ready broiler. Most of the farmer follow the high price in the market and intend to rear chicks. As lots of farmer flock together, the demand increase sharply surpassing the production capacity of the companies and the price increase sharply. When the market price falls down the demand for DOC also falls down and as the companies can not store the live DOC they have to sell the chicks with two days. So they have to reduce price and take other selling techniques to clear the hatchery. High demand: The attacks of bird flu destroy a lot of layer farms creating opportunity for the remaining layer farmers. After the attack of bird the farmer stop purchasing new flock of layer chick fearing loss from the disease and the culling program of the government. This fear of loss creates a vacuum in the production of eggs, creating lack of supply of egg in the market. Before the attack in 2007 the market has a stable price of egg ranging from 14-18 tk per four pieces (hali). Where as last month the price of egg become 28 tk. the price seems to be stable for a long two months as there is a high demand and supply seems to be increasing day by day. Poultry industry is rising but not a satisfactory way. There are many problems exist in the industry. We have to solve all of the problems to raise the sector which contributes a lot to our GDP. In this study, it is tried to find out the problems face farmers and give the possible suggestion of the problems. In poultry industry of Bangladesh faces the great problem of avian flu now. If we fail to get relive from the avail flu then that may destroy the whole industry. We have to save the poultry farms from avian flu as well as protect the industry from further affect of avian flu. It is a dangerous threat for the poultry industry of the whole world. The proper authority should take proper action to protect it and the consumer will be well informed about the disease. Already Bangladesh government refused all type of import from the foreign country. The unethical alliance of dealers, distributors and hatchery owners make the poultry farmer affected by the profit. The alliance makes the high initial cost of production. And about 15% to 20 % reduced price is provided for the farmer. The affect can be shown bellow. There are few hatcheries in our country. They are only effort able to produce quality day older chicken and quality food. But they charge a lot for the day older chickens. Very often it is needed to order in advance before one year from the time to deliver the day old chicken with full payment. Other then some additional conditions are added to the selling offer of day older chicken. Feed would be purchased from the hatchery owner. The hatchery owners take 20 to 25 tk for a day older broiler chicken and 30 to 35 tk for a layer chicken. This is really a huge amount. For that reason the marginal poultry farmers often fail to get profit accordingly. In the same way the distributors and regional intermediaries such wholesalers and retailers make unauthorized alliance to increase price by creating presser to the small poultry farmers and making artificial crisis. About 50% of selling price is taken by both hatchery owner and intermediaries. The marginal farmers get comparatively less profit by recovering the production costs of broiler chicken or eggs. So this unauthorized alliance affect badly in the poultry products market. The local administration can break the alliance to save the root level farmers. And price of the day older chickens should be determined by the public rules. Despite having tremendous potentials, country’s poultry industry has hardly flourished yet as a lucrative sector due to lack of institutional loan facility under easy conditions. Due to collateral provision for getting institutional loans the growth of the sector is thwarted. Though there is a provision to provide bank loan at 10 per cent interest through four nationalized commercialized banks to 14 thrust industries including poultry, the farm owners are not enjoying the facility. The amount of loan is insufficient and interest rate in high. At the same time, conditions of getting loan are not good enough. The farmers who have small farm can easily broaden the farm by receiving loan. The existing farm owner should be given loan in easy condition. Because, these farmers have skills and experiences for continuing new poultry farms. Industry owners are deprived of getting fair price of eggs as a vested quarter is manipulating the prices. Price of inputs of poultry industry has increased but poultry prices have not raised compared to expenditure. The grass root level farmers get less profit for this reason. The farmer should provide the opportunity to recover the cost. Bird flu rumor creates a big problem in the price setting. Such rumor should be control by the government and the media should play a significant role to clear the misconception about the threat. Production cost of egg is higher as 80 per cent of the poultry feed have to be imported from abroad but the egg price have been fluctuating between Tk 13 and Tk 16 over the last five years leading to cost-benefit mismatch. The majority of farms were established in 1995 and the average age of commercial farms was found to be more than six years. Establishment cost of broiler farms was lower compared to layer farms. And the early months of 2007 the price has been decrease for the danger of bird flu. For the cause of price fluctuation the farmers cannot estimate the profit and costs before. So there may some chance of loss. Government can reduce the price fluctuation crisis by fixing the price of feedings and medicines required for poultry. The farmers have a tendency to purchase chicks when the market price of big broiler price is very high. As almost all the farmer think alike they create an excessive demand for the DOC and increase the price. This nature of business should be changed. The farmer should see the business as a all the year round business. Without targeting for profit in single batch, they should consider a collect profit of all the batch of the year. With this strategy farmer will help the company to predict the demand and stabilize the price and demand. There is no abstract policy on poultry industry. But for the farmers and intermediaries should follow a single regulatory policy to give uncertainty away from the market. Tax policy should be liberal like ready made garment industry. Then we can expect a nice industry which will export poultry product in the foreign country. The farms run by the scientific way produce high quality and quantity of broilers and eggs. But many of the farms rarely follow the actual rule of farming. Want of developed day old chickens damage to produce the quality broilers and layers. So the chickens of low productivity require high cost as well as low profit. We should take action for the cause of increasing productivity. First-rate day old chicken is obvious for ensuring the high productivity at first. Another think is the lack of database on production. In Bangladesh there is no statistics for poultry production. For that reason it is quite difficult to estimate the demand of poultry product (eggs or meat) in Bangladesh. The hatchery owners also fall in predicament to produce feeds and day older chickens. Immediately we need to occupy a full database system to collect each type of information related to poultry industry. The backward and forward linkage of poultry industry is not very much supporting of the poultry industry. The infrastructure of poultry consists of roads and transportation system, electricity, communication system, sufficient training facilities, adequate diagnosis facilities, availability of poultry production equipment (feedings, water tanks, vaccination, medicine, lighting materials etc.) and we can say loan facility is another very much important things of poultry infrastructure. These are not available in our country side. The towns and cities are able to get about all the facilities but in the village there are few facilities of those. To increase the poultry production from the village we have to ensure proper roads and vehicles to transport eggs and broilers in the place where the proper demand exists. Electricity supply is very much essential for poultry production. The communication becomes improved for greater telecommuting system but the exact information should be supplied. And training is the most vital things for poultry production. There are many efforts are seen in our country but more scientific method of training is essential. At the same way diagnosis facilities and loan are essential. Many intermediaries are involved in the poultry marketing channel. For this reason the price of eggs and meat become higher. We should take initiative to eliminate the unnecessary middlemen from the poultry marketing channel. It can help to low the price as well as ensure the equilibrium situation of demand and supply. The existing channel members are hatchery owner, day old chicken’s distributors, feeding’s suppliers, actual farmers, wholesalers, distributors, and retailers. We have to try to reduce the number of channel members as far as possible to create a balanced market. To build up a prosperous poultry industry in Bangladesh we need to develop bio-security and disease prevention system. The vigorous poultry industry should be secure from disease and capacity to adopt with the Bangladeshi environment. Some developed class of chicken should be grown in state of unproductive class. The feedings are producing in very horrific way. It would be very harmful to public health if animal waste was widely used as raw material for poultry feed without being treated by the proper technology. But the allegations continue to be made by various sources have been going on for several years. Tannery waste, along with dried fish dust and bone, is used to feed young broiler and layer chickens. 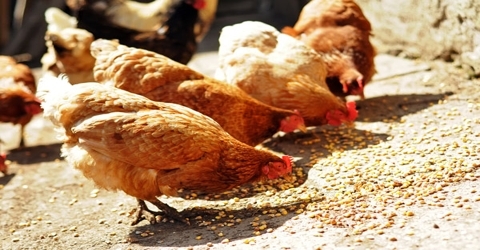 The problem stems primarily from the fact that poultry feed producers are not always using the scientific methods and not going by the health and hygiene standards. In the given picture we see the women are preparing poultry feeds by using tannery waste. Poultry is a fast growing sector which contributes significantly to the economy. So the proper authority should take action against the unhygienic way of feed production. The imported medicine, vaccination, and other technological knowledge are very essential for poultry. The machine of dressed chicken used to cut into the chicken in different peaces. Another things is important also exporting the poultry product specially meat in the foreign countries. Government will take initiative to make a sound exporting policy for the betterment of poultry product exporting. There is a great matter that we need not import any poultry feedings from abroad. Now we may export feedings in our out side countries. Bangladesh imports 3.5 to 4.0 million pieces of one-day-old broiler-breeder chickens from France, UK, Malaysia, Denmark and the Netherlands spending huge foreign currency. Soon we should get self-sufficiency to produce one-day old broiler-breeder chickens. C P Bangladesh Co, LTD has started its business with a very limited resource but with lots of experience. By 2008 it has establish 4 feed mills and 3 hatchery targeting poultry industry. It has the vision to be the leader of agro-business of Bangladesh. If the bird flu may have not attacked it would invest a lot more in the industry. But C P still believes that there is a great opportunity in the poultry in Bangladesh as there is demand for poultry product and Bangladesh’s economy is growing confidently.